This article is about the boss from DK: Jungle Climber. For the enemy from the Mario franchise, see Big Amp. 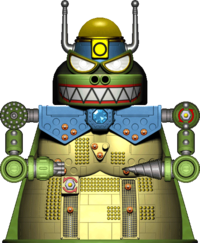 The Mega AMP is an enormous robot, the design of which is based upon a Kremling. The Mega AMP is constructed by King K. Rool and his minions. In DK: Jungle Climber, the Mega AMP appears as the boss of the third island, Ghost Island, in the Panic Factory; before King K. Rool has one of his Kritter henchmen, that is empowered by a Crystal Banana, enter the cockpit of the Mega AMP. He mentions that the robot was only partially finished being constructed. In order to damage the Mega AMP, Donkey Kong, while avoiding energy balls and bombs shot by the Mega AMP, needs to shatter a crystal in its chest using a lever and unscrewing a metal plate on it. Doing this exposes red buttons that need to be smashed. After these two buttons were smashed, the Mega AMP gets out of control and its Kritter pilot leaves the cockpit of the Mega AMP. They begin attacking by throwing bombs. Hitting the Kritter pilot defeats and destroys the Mega AMP. Later in the game, on the King Kruiser IV, the Mega AMP is fought again, but this time, is improved in many ways such as shooting mines instead of bombs, has a new built in drill and even a new switch. Though powerful, the giant robot is ultimately destroyed for the last time. This page was last edited on April 12, 2019, at 12:03.